It is a vital growth area near the end of a long bone, which later fuses with the main bone through ossification. To be more precise, it is the rounded end of any long bone wherein the part joins with adjacent bones. The Epiphysis is surrounded by the articular cartilage at the joint area. It is further divided into proximal, radial and distal sections. It is often mistaken for epiphysis cerebri, a small endocrine gland in the brain. Its plural is epiphyses. 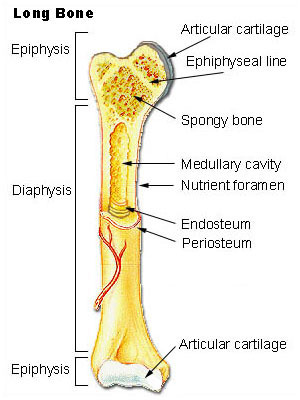 The most notable part is that the Epiphysis has red bone marrow in it that produces red blood cells (erythrocytes). It is pronounced as e·piph·y·sis. It is present in the joints. The particular location of the Epiphysis is at the cartilaginous end of the articular surface or long bones. It is the secondary centre of ossification. The distal Epiphysis is described as the rounded end of the bone, located at the end part of the diaphysis which is located away from the central point of the bone. The end of a long bone is usually swollen and resembles a clenched fist. It is composed of compact or cortical bone on the outside and spongy, or trabecular, bone on the inside. 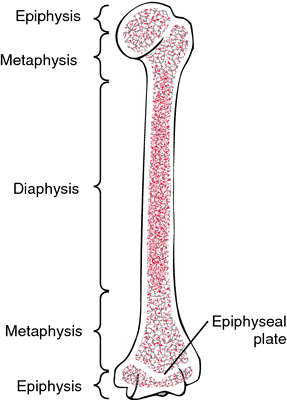 The epiphyseal plate, a hyaline cartilage disk in the wider portion of a long bone, called metaphysis, is situated between the growth site and diaphysis, the midsection of the bone. The expanded surface of the semi-rigid, calcified tissue is covered with articular cartilage that separates it from an epiphyseal plate-like structure called subchondral bone. The end portion of the long bone is non-articular in nature. In simple words, it does not form joints. However, its nearness to the articular part of the bone makes the non-ossifying section, a potential site of attachment for supporting ligaments and tendons. In the course of time, the expanded area undergoes ossification. Tubercles of humerus (lesser tubercle and greater tubercle) and trochanters of the femur (lesser and greater) are the typical examples of the non-articular end of long bones. In this type, the growth end of the bone is a result of a fusion of certain bones in the limbs due to evolution. However, the Atavistic Epiphysis comes in separated joints in four-legged animals. The coracoid process of the scapula is one of its common examples. Another example is the posterior tubercle of the talus (ostrigonum). It is slightly different from the normal structure and does not appear on a frequent basis in the bones. It is most often seen in the head of the first metacarpal bone. It is also seen at the base of the rest of the other metacarpal bones. It is composed of red bone marrow, the main producer of erythrocytes/red blood cells. It also helps in the transmission of weight from areas subjected to tremendous pressure and force. In simple words, its function is to uniformly distribute pressure across the joints to assist in easier mobility. The porous nature of the enlarged section lightens the weight of the bone. In young children, long bones elongate when new cartilage, produced in the epiphyseal plate, is pushed to the edge of the growth site. On the other hand, older cartilages located at the diaphysis get converted into new bones. The growth of the bones usually ceases between the ages of 18 and 25. This phase is usually called epiphyseal closure. The knobby growth end is often prone to slipped capital or subcapital femoral epiphysis, in which the ball of the hip joint separates from the femur. The end region of the inner and larger of the two bones of the lower limb, extending from the knee to the ankle, called tibia, may fracture due to a traumatic force. Fibular epiphyseal fractures are quite common in children. In some cases, the growth end of the calcaneus or heel bone becomes irritated and inflamed, causing extreme pain and restricted movement. The longitudinal epiphyseal bracket is a rare deformity involving the long and short bones of the limbs, resulting in growth defects. It should be noted that of all the types of Epiphyseal disorders, Multiple Epiphyseal Dysplasia (MED) is medically described as a rare genetic disorder that negatively impacts the end of the long bones. The epiphyseal plate (or the growth plates) towards the end of the long bones may expand outwards due to the expansion of cartilage triggering the condition. The cartilage that grows outward of its own form hardens (the process is known as ossification) and mineralizes over the time. This is defective form, a type of Epiphyseal disorder that is caused by several reasons. Once the symptoms are diagnosed, the right treatment option ensures adequate recovery. Mutations caused in the COMP gene trigger the effect of pseudoachondroplasia. This badly affects the structural integrity and extracellular matrix protein that potentially suppress apoptosis and apoptosis in chondrocytes. Along with this, the smooth muscle cells in pathological and physiological stimuli are poorly impacted. It can be concluded that mutations in genes like COMP (chromosome 19), COL9A3 (chromosome 20), COL9A1 (chromosome 6), MATN3 (chromosome 2) and COL9A1 (chromosome 6) lead to Multiple Epiphyseal Dysplasia. Certain analysis and tests ensure the right diagnosis that includes genetic analyses, radiographic and clinical findings as well. An Orthopedist ensures the possibility of the right treatment option. Some of these treatments include physiotherapy for the strengthening of the muscles, analgesic medications and nonsteroidal anti-inflammatory drugs. If none of the treatments helps, surgery is the only option. Surgery is required for the treating malformation of the hip (the collum femoris or osteotomy of the pelvis), total hip replacement. Not necessarily, surgery is the only option since certain precautionary methods can also help over the time. They include avoiding sports that include joint overload, cycling and swimming. Sometimes, using deambulatory aids, crutches or a wheelchair may avert hip pain. Also, if you have a problem when writing with your hand, you may use a pen having a wide grip since it aids in flexibility.